Not everyone wants to lug a DSLR around, and compact system cameras offer top-notch quality without the fuss. Sony’s NEX cameras have become a popular choice, and this, the NEX-6, sits between the top-end NEX-7 and the recently released 5R, with which it forms a slightly awkward Venn diagram of features. This series of cameras has no truck with pre-digital conventions like optical viewfinders. Unlike the 5R, however, the NEX-6 does have an electronic viewfinder (E VF), with an impressively sharp 2.4 million dots, which you can use instead of the enticingly large 921,600-dot LCD for composing shots. While most CSCs with viewfinders are designed to resemble shrunken SLRs, we like how this one uses the same boxy design as the rest of the NEX range, keeping it as small as possible. Indeed, dispensing with the viewfinder hump makes it significantly smaller than most other CSCs at this price. There’s still a reasonably substantial handgrip, but not a huge amount of room for buttons and dials. Here again, though, the NEX-6 does try harder than the 5R, providing mode dial on top, with a command dial encircling it, as well as the navigation pad beside the screen, which also doubles as a control wheel. The 5R has a couple of knobs for manual adjustments, but the lack of a mode dial leaves you to dive into the on-screen menus to access its functions. Another benefit over the 5R is the integral pop-up flash, which saves having to clip on a separate unit. Beside it, in place of the frustratingly proprietary accessory port on its NEX siblings, is a standard hotshoe. Still missing is a jack for an external mic, which would have given video users more options for shooting without separate audio. ISO speed, drive mode and exposure compensation are a single button click away, and five other settings can be assigned to the customizable Function menu. We’d have liked a physical manual focus switch and a dedicated white balance button, but we’re not sure where they would have fitted on the extremely compact case. Full live view is a benefit of Sony’s mirror-less engine, and the 3in screen lets you frame shots easily, even in direct sunlight using the Sunny Weather option. Although you can see pretty well whether the image is in focus, the screen, unlike that of the cheaper 5R, isn’t touch sensitive, so you can’t tap to quickly set the autofocus point. The NEX-6’s new 16-50mm kit lens is a little wider than the 18-55 previously seen in this range, but no faster. Its main advantage is that it’s tiny, collapsing down to 30mm when the camera is switched off - half the length of the lens that conspicuously dwarfs the 5 and 7 models. The motorized zoom can be controlled by wire using the lens ring, which is surprisingly effective. The entire zoom range can be traversed in a quarter of a second, yet small, precise adjustments remain easy to make. This is also a very sharp lens, with none of the corner softness we’ve seen from the 18-55mm kit option. Like the 5R, the NEX-6 has WIFI built in and can upload photos to Facebook over a WIFI network or create its own hotspot for direct transfers to an iPhone or iPad. A free remote control app offers a live feed and shutter release, but doesn’t give access to other settings. The camera itself can download additional Sony apps to expand its capabilities, but so far there are just a couple of freebies for creative filters and basic editing, plus two $6.5 tools for bracketing and noise reduction. The 16 megapixel sensor matches that of the 5R, giving impressively low noise in poor light. 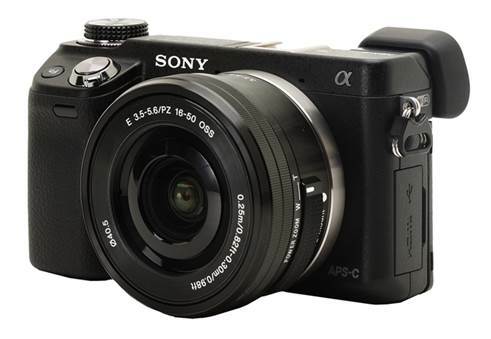 It’s on a par with the best SLRs at this price, and comfortably ahead of any other CSC. This updated version of the sensor incorporates phase detection to speed up autofocus, and outperformed the 5N in our tests. When both cameras were required to refocus repeatedly on near and distant subjects, the NEX-6 averaged 0.54 seconds from pressing the button to capturing a shot, while the 5N came in at 0.72. That’s enough of a boost for us to say autofocus performance is no longer a concern. The NEX-6 is a fast camera in most other respects, too, taking 0.7 seconds between shots for both JPEG and raw. Continuous mode is LOFPS, slowing to 2.9 after 12 frames. Image quality was as high as we’ve seen from a CSC, with crisp details complemented by the low noise levels. Our auto exposures were sometimes on the dark side, but the extra highlight headroom is welcome when processing raw files. Otherwise, a bit of exposure compensation provides an easy fix. Priority and manual exposure modes work in exactly the same way for photo and video. With Full HD capture at 25p, 50i or 50p and clips up to the standard 30 minutes long, this is one of the most capable cameras in its price bracket for video. Autofocus is smooth and silent, and the motorized zoom isn’t too invasive on the stereo soundtrack. If the NEX-6 is very nearly perfect, there are still a few items on our wish list. The 5R’s touchscreen may seem like a gimmick but is sometimes handy, and its LCD flips up completely to face forwards, while the NEX-6’s stops short (neither hinges sideways). We wished we could hear a beep to confirm autofocus without a clicking sound every time we pressed a button or turn a dial (it’s all or nothing). We’d also have liked to be able to disable the text descriptions that appear each time the mode dial is adjusted. These are mere quibbles, though; the NEX-6 is an outstanding camera. Sony already dominated the C SC market for sensor quality, but with faster autofocus, better controls, hot-shoe and integrated flash, the NEX-6 feels like the interchangeable lens camera we’ve been waiting for. It’s hard to imagine a more accomplished compact. The 5R, however, has the same sensor and WIFI plus a touchscreen, yet with its 18-55mm f/3.5-5.6 kit lens, admittedly builder and not quite as sharp as the 6’s, it costs just $739. It’s a tough but very welcome choice.